It was a little over a year ago that we lost Jon. I’ve thought about what, if anything, I was going to write. This probably isn’t what I was planning, but I feel like I need to put something out there. This has been a hellish year. I lost my son and my last grandparent in the space of 3 weeks. The family has dealt with some health issues and some other extended (to me) family deaths. The one bright spot was the birth of my nephew (and my wonderful niece, I can’t help but to be happy when I’m around her, I think she knows I need some happiness), but unfortunately for me that was muted because it happened literally days after Jon’s death. I’m just fortunate to have a great wife and great family to help get through this. I am not the same person I was a year ago. I put on a good face at work and while out, but I’m not the same. I am pretty much always sad. Things that I never would have thought twice about bother me, especially sayings like “bite the bullet”, “kill me now”, or “just shoot me”, and don’t even get me started about the “make a gun out of your hand, hold it to your temple and pull the trigger” motion. I cringe every time somebody at work says or does something like that. There’s times during the day that I just stop and look at Jon’s picture on my desk and I am incapacitated for a few minutes. We still have boxes of Jon’s stuff sitting out in our basement. I just can’t deal with doing anything with it. I don’t want to throw his stuff away because it’s all I have left of him physically. I don’t want to get rid of his clothes (and trust me when I say he had a ton of clothes, most women wouldn’t have half as may clothes and shoes as he did) because I can look at them and “see” him. We’ve got all sorts of “stuff” that I normally would have just got rid of, but instead we still have it sitting there. It’s out of the way, but it’s still there. I know that in time we’ll pack things away and probably get rid of some things, but for now, there’s comfort in just seeing those things. I can now totally understand how parents who have lost children who still live at home never touch their child’s room again. Had Jon still lived at home his room would have become lost in time. I used to think that was very weird but now I know I would do the same thing. My wife and I went to the cemetery on the 11th. The snow had finally melted and it had been warm and windy enough lately to make the ground solid and not a big muddy mess. We brought out some roses and added them to the other flowers that were already put there today. We just stood there and cried together. I still go out at least once a week (I would bring a shovel during the winter and clear off his headstone and stomp a path to it), but that day was something more important. That night we had dinner with family to remember Jon. We went to the pizza place that we went to (and still go to) every Friday night. We had 12 of us there, all close family, and it was great that we could come together, it is just too bad that the circumstances were what they were. It was tough but it was good. It helped us all remember him and catch up with each other. I want to thank Michelle (the owner) and especially our wonderful server Ashley at Pizza Factory for closing off the dining room and allowing us our time. We really appreciate it. Jon, rest in peace, and know that you’re never far from my thoughts. I love you. As you can probably imagine, the Christmas season this year has been very tough. At our house, we never went whole hog for Christmas, but we always put up some decorations, stockings, tree and such. This year there was nothing. There is one ornament hanging from our mantle, it’s a crystal heart that has Jon’s picture engraved in it (thanks Mom!). I almost dug out our stockings, but couldn’t. The house doesn’t look any different now than it normally does. We didn’t even put up the tree this year. A few years ago we didn’t put one up either, but that was in protest. I would always try to get everybody to help put it up but would get very little response. I wanted it to be a family experience, one we could look back upon and smile at. One year I just said that if I didn’t get help putting it up, I wouldn’t do it. My wife and Jon said, “OK”, and went about whatever they were doing. I stuck to my word and didn’t put the tree up. I think that it accomplished what I wanted though because after that year I always had help. Nothing was ever said, but it was something that I think we all enjoyed as a family. This year my wife and I couldn’t do it. We just couldn’t get into that happy place where we thought it would help. Our family puts an angel on top of the tree. It’s always been the tradition that the kids put it on. When Jon was little, my favorite part of the tree trimming was holding him up so he could put the angel on top of the tree. 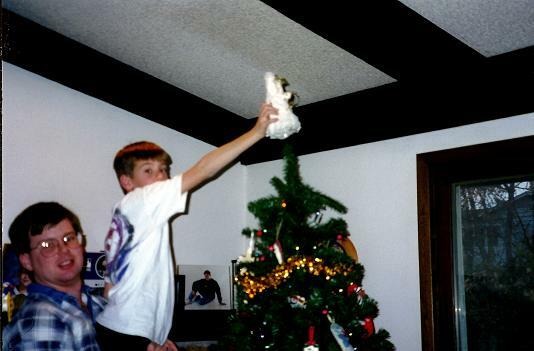 Chris holding Jon up to put the angel on top of the Christmas Tree. December, 1997 (Jon was 9). This year there was none of that. Christmas has kind of snuck up on us. I didn’t feel in the mood at all. I couldn’t even think about presents or anything. I was at Target the other day and I thought I’d look for something small to put at the grave site for him and I about broke down in the middle of the store. We didn’t even get anything for my brother’s kids until Christmas eve day. Even our traditional family get together on Christmas Eve seemed in doubt for a while. Thankfully my brother pushed it through and we got together, even though it was really tough. It’s good that we did, it just wasn’t the same. Jon’s other grandparents came by for a few minutes and it was good to see them. The last few years Jon had hung around with us for a bit, then inevitably went out with friends, but he was always there and this time he wasn’t and it was very difficult. My brother’s kids had a great time and had lots of presents to open and their excitement made it hard to be too sad the whole time. My parents and my wife and I had lunch with Emily on Christmas Eve. That was really nice and it was good to see her again. We talked about a lot of things, but inevitably the conversation would turn to Jon. It’s the common thread between us all, so that makes sense. It was kind of like he was there though; they sat us at a table for six so there was an empty place at the table and I envisioned he was there with us the whole time. We exchanged gifts, and then suddenly the table got quiet and everybody did all they could to not start crying at the table. It wasn’t easy, we all miss him so much. Unfortunately, I don’t have many pictures from last year’s Christmas. For some reason we didn’t do a family one (or I don’t have it). You don’t think about it at the time, but you always think there will be another time to get a picture. Unfortunately, that’s not always the case. After a wonderful Christmas day lunch at my brothers (traditional lasagna 🙂 but it was awesome!) my wife and I went to the cemetery. Due to the fact that we keep getting snow here (almost three feet in December alone), getting to the grave site is kind of difficult despite the land being flat. We brought along a light tree thing to place there for him. The wreaths that are there were snow covered and it had a very “Christmas” feel to it. The headstone was already cleared away (we later found out my parents went out before lunch) so I didn’t have to clear away much. We went there and wished Jon a Merry Christmas. The rest of the day was pretty somber. I hope everybody else had a great Christmas. We got through it, and sometimes that’s all you can ask for. Have a safe and fun New Year! 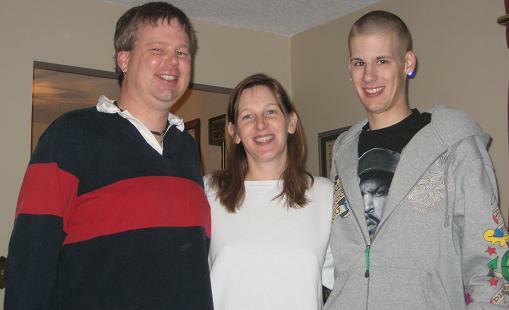 Today would have been Jon’s 22nd birthday. Like all parents, I will never forget that day. It is still the happiest day of my life. It wasn’t supposed to be that day, he was born more than 2 months premature, weighing just 3 pounds 1/2 ounce. He had to fight for life from the start, and fight he did. He was in the hospital for almost two months. He was surrounded by love the whole time, not one day went by where he didn’t have numerous people show up to see him. He was surrounded by love his whole life, we were always proud of him. I had to take the day off work today, I would have been a wreck had I gone in. Between Thanksgiving without him and his birthday a mere four days later, it’s all I can do to keep it together, and I haven’t been doing all that great of a job doing that. I’ve been playing a lot of WoW because it’s pretty mindless entertainment that can keep me busy for a long time. It keeps me distracted so I don’t dwell on things. Maybe that’s not the right thing to do, I don’t know, but for now, it keeps me sane. I went to the cemetery already today. I had some things to do there by myself. I brought him a Red Bull and a cigarette from the pack that I buried with him. I talked to him there. I’ve got cupcakes and candles to bring out later. Maybe it’s stupid, but it helps me connect a bit. Traditionally we would have had dinner at home or at my parent’s house. It was a family thing, us, my parents, my brother’s family and Emily. We’d have cake and open presents. Grandma and Grandpa Marino would come over. We’d talk for a while and just have good family time. It wouldn’t take all that long, maybe an hour or two, especially as he got older and had friends to see, but it was always something special. Tonight my wife and I will go to the cemetery together. Then we are making shepherd’s pie, one of Jon’s favorite. We’ll have some cupcakes as a birthday cake. It won’t be the same obviously, but we’ll still celebrate and try to think of good times. While there will be many memories, ultimately it will end in crying. 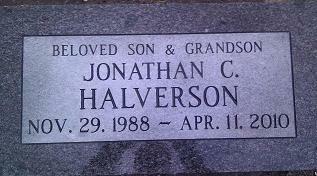 It is hard for me to describe how I felt, finally seeing Jon’s name in stone. It was comforting, but very, very sad. I felt grateful to finally see his name engraved, but it also cut me to the quick. The marker reminded me so keenly of our loss, that Jon was never coming back. It’s been a bit over a month since we buried our son’s ashes. We had a short ceremony with family (including his girlfriend, who counts as family). The day was sunny and it was as beautiful as you could want. It was a nice respectful ceremony and things went well. We went out to eat together afterwards and it was a nice cheerful meal with good conversation. We had Jon cremated and from that time until then we had his urn sitting on our fireplace hearth. That was fine for my wife and I, but made it hard for others to grieve. People need to be able to go somewhere and have something tangible to see. I didn’t want to give him up though, I wanted to keep him at home forever. After a while I realized that was terribly selfish. I saw that people needed a grave site to go to. They wouldn’t say it, but I could see it and could read into what they were saying. Nobody pushed it, and even after we bought the plots they said, “Do it when you’re ready”, but I could see that people wanted it. I realized that it was very important for everybody and I made plans. I didn’t think it’d affect me much given that we’ve had him at home for so long. In fact my wife and I talked about it the night before and I specifically said that I didn’t think it’d bother me. The day of the ceremony my wife and I rode to the cemetery with her parents. I held onto the urn tightly the whole way. When we got to the cemetery we were standing around waiting for everybody and I wouldn’t let it out of my hands. We then walked to the grave site and there was a place to set the urn. I was the last one there, and I started crying as I slowly walked up. My hands shook as I set the urn down. It was really hard to walk away, but the great thing is now people (including me) can go somewhere and grieve. I know we made the right decision in getting this done as it will help everybody. I go there about twice a week. I sit there and cry and talk to him. I know others are going because there’s been other flowers and other signs that people are visiting (myself and somebody else writes “Jon” in the dirt, the headstone hasn’t been delivered yet). I’m glad people are able to go somewhere to grieve, to remember and to help themselves through whatever they need. Our boy is now at rest. We have some of him with us, which is good. I now see a void on the hearth, but I know that he’ll always be here with us and he’ll live on forever in our hearts and memories. Yesterday I turned 40. Oh Em Gee. Forty is one of “those” ages that make you think a bit more about getting older. I still feel fairly young, but turning 40 makes you think a little bit more. It was kind of a weird day. I woke up and felt kind of “meh” about things. I went off to work and nobody really mentioned it. Now I don’t really go looking for this type of attention, but a couple of my friends at work are very much on top of this type of thing. They make sure people know about it, will go get treats, etc. Only one of them mentioned it, and she didn’t mention the “40” part. We had a surprise company meeting and I went there and stood in the back of the room. One of the aforementioned persons had a spot up in the front and got me to sit up there. I nervously went up there and kept looking at her sideways just waiting for her to say something. The meeting ended and thankfully nothing was said and I went back to work for the day. Today (the next day) rolls around and they both came up and said they totally messed up. I thought it was actually pretty funny since they are normally so on top of it, but it was all good. We went to lunch with some other friends and it was a good time. The rest of the day was kind of strange. I wasn’t sure how to feel. I have been very sad lately and this was kind of tough. I ended up going to the cemetery for a few minutes on the way home. I sat down on the ground and talked and cried a bit. It was tough not to have Jon here for my birthday (or any day, but…) but in some ways I felt better afterwards. That night my wife and I didn’t have anything planned so when my mom called to wish me happy birthday and then asked if we wanted to go out for dinner we said “Yes.” The four of us went to Champps (a sports bar type place) and took about an hour and a half to eat. It was a good time and we had some good talks. Everything was happy, which is rare. It was a really good time and it cheered me up. When we got home my wife gave me my gifts which was the DVDs for “The Guild” and “Dr. Horrible’s Sing Along Blog”. I love these and it made me smile. We watched an episode of Supernatural and that was pretty much the night. All in all it was a good, if slightly confusing, day. There were no new creaks or anything, although I think I’m going to have to get some reading glasses soon (ug). It was friends and family that made the day(s) and I thank them for it. There were no #1 Dad mugs given. There were no happy hugs and “Happy Father’s day” comments. There was no “I love you Dad”. The scale I use to judge “the worst day ever” has dramatically changed since April 11th, but suffice it to say that today was up there. The whole day has been tough. I can’t stop thinking about Jon. We tried to keep some semblance of normalcy, but it was tough. We went to lunch like we normally do on Sunday, except that my brother and my dad weren’t there because they’re in Costa Rica, which had the strange side effect that I couldn’t even say “Happy Father’s Day” to my dad, and that was nice. Audrey was cute as could be and helped keep my mind off of things (she gave me an extra hug without having to ask, it felt really good). When we got back home my wife kept busy all day doing all sorts of little chores (including things that are normally “mine”). I sat on the deck and had a cigar but instead of relaxing I actually did some work because it kept my mind off things. It didn’t work all the time though, I had to stop and hold back the tears. Imagine looking at Java code and suddenly you get overwhelmed and no matter what you do it takes over. My wife invited my mom over for dinner and I grilled up some steaks and we chatted for a bit. She gave me a card with a nice note in it, and as hard as it was to read, it was nice. Instead of talking with our son, we ended up talking about something a parent should never have to do: we talked about our son’s grave site and marker that we picked out the day before. My wife and I finally decided that we should get that done, if not for us, for others to have a place to “see” Jon. We also bought plots for the two of us so that we can all be together. Jon will be buried between the two of us and we’ll all be together. Soon Hillside Cemetery, Section P, Area 142, Plots 1B, 2B, and 3B will have similar grave markers marking the Chris and Michelle Halverson family. Unfortunately, one of them will already be completely filled out. My wife and I ended up watching a favorite light hearted movie (“The Princess Bride”) and then I went out to watch TV. I would just sit there. I held Jon’s urn. I cried. During the day things hit me in Target, Cub grocery store, a number of times in the car, on the deck, on the couch, watching the movie and basically everywhere. I know it’s “normal” but it still sucked. It was basically a terrible day. There were some good points, my mom and wife did a great job helping, but it was still terrible. 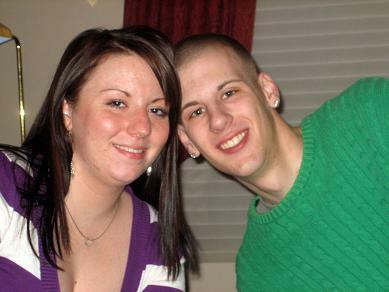 I miss Jon so much and at times I just don’t know what to do. All I know is that I just try to go through one day at a time. It sounds cliche, but it’s true. Some days are so tough, other days I can handle things just fine. I don’t know what the day will be like, so I just try to deal with things as they happen. Contrary to what you kids nowadays know, pictures weren’t always available immediately and already in a digital format. I have about 10 what we call “albums” that have actual printed photos in them. These were taken on “film”, which you had to buy separately from getting prints made. You also didn’t have immediate feedback, you had to take the film in (after you took the full roll, so it could be months later) to be processed. It’s quite a bit different now where you get instant gratification. Heck, my cell phone (Google/HTC Nexus One) can take HD 720p video and is a 5 megapixel camera. So I’ve got a couple thousand pictures to scan. You’d think by now automatic feeder scanners would be cheaper, but they are still very expensive. I’m using a flatbed wireless scanner (HP C4780) which is working out pretty well. The software is traditional HP, in other words, you have to install a couple hundred megs of software to make it work, but it does work well. The scanning software allows me to easily scan 3 photos at a time and it will store them where I want. I’m using Picasa as my photo management software because I’ve been using it for a while now. The only thing that made it difficult was wanting to make use of it on my network, that is, I want to store my photos on my network and work from there. Unfortunately, Picasa stores some data in your “user” directory which makes it decidedly non-network friendly. Thankfully somebody has written a launcher that will make it work (see PicasaStarter). So far I’ve scanned about 750 pictures. I’ve also started to go through and clean up my existing photo library. Picasa has a great face recognition feature which makes things really nice in terms of finding people. I’ve also been going through and geo-tagging photos which is another nice feature of Picasa. I do like Picasa, but if anybody has any other suggestions, I’d be interested in at least looking at it. I’m still only about a quarter of the way through, and these are just my photos. I’ve already told my mom that I’d scan her photos too. She takes a lot of pictures and has a lot of albums. Those albums would generally be of me and my brother growing up so I have some personal interest in those and while it will take a while to get done, I really want to do it. Scanning in these pictures has been an interesting experience. Almost every one has Jon in it. It’s been tough at times. Many times I’ll stop and just look at one and remember the time it was taken. The upside is that I am remembering those times, and they were all happy times. While I wish I wasn’t doing this as a way to remember him and that I had him back, it is nice to remember the good times. Here’s some advice that I’ve learned through doing this: Take a lot of pictures. In this day and age of digital photos, there’s no excuse not to. This not only applies to parents taking pictures of their kids, but also to adults when you’re with your parents. You just never know when you’ll never get the chance to take another picture of your loved ones. You don’t want to regret not having more pictures. I’ve watched “Deadliest Catch” since it first started. It was one of the shows that Jon and I used to “watch” together (ie. we either literally watched it together, or we did separately but talked about it later). I’m a sucker for some of these shows like “Ice Road Truckers”, “Black Gold”, and a couple others. That’s so true. Looking back, with the 20/20 hindsight, I wish I would have spent more time with Jon, even just doing stupid stuff. It’s one of those things that you don’t always think about until it’s too late. We did spend a lot of time together, all things considered, after all, what 19 year old wants to spend all that much time with his old man? To a point, yes, but then again, he’s dealing with his own growing up and other issues, he needed his own time. It’s one of those “woulda, coulda, shoulda” things. Would have it changed anything in the end? No. Would it make me feel better now? Yes. I do know that I did spend a good amount of time with him, and near the end, as much as he’d let me, but looking back it’s easy to find times I could have done better. I’ve come to accept this, and know that I did OK. It’s still hard to think that if I had done XXXX differently, things would have been different, despite knowing that deep down that’s not true. Last Sunday was a very happy day for our greater family: my new nephew Alexander was baptized. The ceremony went well and we went out for a great brunch buffet with my parents and my sister-in-law’s family afterwards. I now have the great honor of being a godparent to both of my brother’s children and I am very proud to be that for them. I have to say that it was still tough for me. The ceremony was fairly quick, but at the same time, I was holding back tears while I stood up in front of the church with my brother and sister-in-law and her sister. I scrunched up the program that I was holding. I didn’t want to feel that way, I was (and am) so happy for my brother. Thankfully I got a bit distracted while I was up there because my brother asked me to take a couple camera phone pictures and then the pastor handed me the baptism candle to hold up. Part of Jon was with us though. I almost always carry around a Zippo lighter of his. Honestly, I don’t know if he really used it, but it was his and it’s easy to bring along. In my mind, he used it and it meant something to him. I reached into my pocket while up at the altar and touched that and knew he was with us. Little Alexander was born the night before our son’s funeral. My wife and I made it down to the hospital that night, and we were so happy for my brother and sister-in-law, and we wanted to show them that we were happy for them. That night I held that innocent newborn little boy and it was everything I could do to not totally break down. It was so hard. Here was my brother celebrating one of the most joyous life experiences they can have, and 18 hours later we were going to have a funeral for our boy. I could only hold him for a minute, but I’m glad I did. It was such a good thing and it gave me a happy feeling, even for a minute. I honestly feel that the good that was in our son was passed onto this little boy (and Jon did have a lot of good, we’ll discuss that in the future). To make matters even more “interesting”, his funeral was on my niece’s birthday. Unfortunately for the rest of her life when we celebrate her birthday, we will, even if we don’t talk about it then, be thinking, “this was the day of Jon’s funeral”. Thankfully she just turned two, so hopefully it won’t detract from her celebrations in the future. 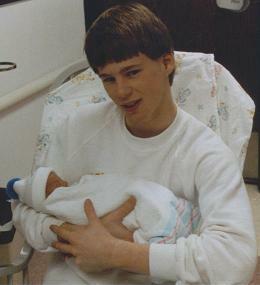 Jon was born almost three months premature. We didn’t have a formal baptism for him, we had the hospital chaplain baptism him because we honestly didn’t think he’d survive (he weighed 3 lbs. 1/2 oz). I never got to have this experience with my own son. I know in the grand scheme of things, it probably isn’t that big of a deal, but it’s just one of those things that hits you when you cannot have any further experiences with your boy. As tough as it was to stand up there and celebrate this event, it was a great thing and I’m very happy for my brother and his family. Despite almost breaking down and crying while standing in front of the whole church, it did make me think of happier times of Jon. Congratulations Nick and Jeanine, you have a beautiful boy.